We’d love your help. 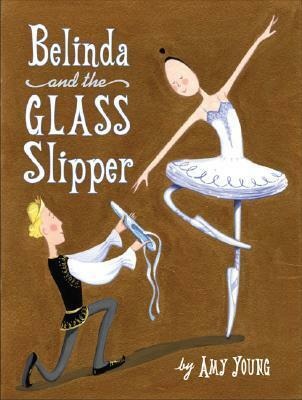 Let us know what’s wrong with this preview of Belinda and the Glass Slipper by Amy Young. Big star, big role, big feet . . . Belinda is back! Only one person can fill those gigantic glass slippers, and that's Belinda the ballerina. Full color. To ask other readers questions about Belinda and the Glass Slipper, please sign up. What's not to like about fairy tale retellings? In Belinda and the Glass Slipper, Belinda auditions for the Grand Metropolitan Ballet's production of the classic, Cinderella. She has to beat out fellow ballerina, Lola, for the title role, and she does thanks to her huge, perfect feet. But Lola won't let that setback stop her from trying to steal the spotlight. When I finished reading this, I wanted to read it again right away. It pays pays homage to Cinderella (naturally) with adorable winks and What's not to like about fairy tale retellings? In Belinda and the Glass Slipper, Belinda auditions for the Grand Metropolitan Ballet's production of the classic, Cinderella. She has to beat out fellow ballerina, Lola, for the title role, and she does thanks to her huge, perfect feet. But Lola won't let that setback stop her from trying to steal the spotlight. When I finished reading this, I wanted to read it again right away. It pays pays homage to Cinderella (naturally) with adorable winks and nudges, but stands alone as a humorous tale. I loved, too, the ending, because sometimes our talents are made for other sports. Belinda is auditioning for the Grand Metropolitan Ballet's production of Cinderella. She is the perfect dancer for the part. Miss Lola Mudge boasts that her "perfect, tiny feet" make her ideal for the lead, but she loses out to Belinda's superior skills and grace. On opening night, Lola locks Belinda in a broom closet and takes her place as Cinderella. With offstage help from her onstage fairy godmother, Belinda arrives in time for the prince to try the glass slipper on her foot. One thing is ce Belinda is auditioning for the Grand Metropolitan Ballet's production of Cinderella. She is the perfect dancer for the part. Miss Lola Mudge boasts that her "perfect, tiny feet" make her ideal for the lead, but she loses out to Belinda's superior skills and grace. On opening night, Lola locks Belinda in a broom closet and takes her place as Cinderella. With offstage help from her onstage fairy godmother, Belinda arrives in time for the prince to try the glass slipper on her foot. One thing is certain: no one but Belinda can fill her shoes. This is the first Belinda story I have read. Fun! Some mean content due to the Cinderella theme, but a great story about being proud of what makes you different. A retelling of Cinderella as a big footed ballerina who is torched by Lola, a fellow ballerina. Natalya's new favorite book. Belinda has been cast as Cinderella in the ballet. She has very large feet but is very graceful. But she must compete for the roll of Cinderella. One of the girls wants the roll so bad that she locks Belinda in a closet on opening day. But Belinda still manages to get her Prince. Belinda is in a production of Cinderella. One of the other ballerinas thinks she should be Cinderella so she makes the ballet more like a true Cinderella story. Read to find out how the ballet turns out for Belinda. Belinda in a take off on the traditional Cinderella story, sure to be enjoyed by Belinda fans. Today has been Belinda-filled! I love how this author tells a story. Another fun Belinda adventure with a fairytale twist. Most enjoyable read. We love the two Belinda books we've read, so I'll be tracking down this one as well. This book was so cute! A new take on the Cinderella story, the book gives an account of a ballerina who deals with the actions of a jealous girl who wants her position. Adorable. Belinda is in a production of Cinderella, but her story also mirrors the Cinderella story, so there's kind of a trippy melding going on. Really fun, and I love how Belinda asserts herself. Belinda is the lead in the ballet, but Lola wants the part. Read the book and discover what happens when Lola tries to sabotage the ballet. This is a fun Cinderella story about a talented ballerina with big feet. Being a big footed ballerina myself (though far, far less talented than Belinda), I can't resist these books. And I especially like the twist at the end of this one! Great remake of Cinderella involving my beloved Belinda. My little girl enjoys every story she is in. Great book to use when showing your students that their is only one of them. I really liked this book! It just spoke to me for some reason. Great book that models self-acceptance, in this case having big feet as a ballerina who is to dance as Cinderella. A wonderful relief from all the 'perfect' physical attributes versions. Belinda is a ballerina who has gigantic feet. When she competes with a girl for the part of Cinderella in a show, the other girl sabotages Belinda. This was not what I was expecting but a wonderful retelling. Two dancers vie for the lead role in the ballet of Cinderella. When the girl with the large feet (but the better dancer) get the role, the other girl begins to plot a way to undermine her. Lots of Cinderella-esque themes in the behind the curtain drama, wherein the chosen ballerina gets her recognition by fitting the ballet shoe. Kinda meta. Amy Young trained as a fine artist at Yale and received an MFA in painting from Indiana University as well as a law degree from Harvard. She lives in Spring Lake, Michigan.